No building in Paris has exercised such a magnetic attraction on visitors for the last 30 years. And no, we’re not talking about the Eiffel Tower. 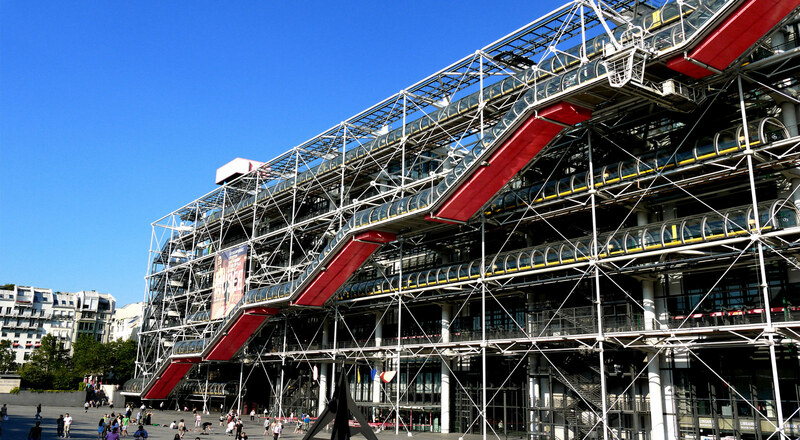 The Centre Georges Pompidou was designed in 1977 by two then-unknown architects: Renzo Piano and Richard Rogers. Since then, it has become Europe’s most-visited building, drawing more than 7 million visitors every year: that’s more than the Louvre and the Eiffel Tower put together. The principal attraction of the building is its curious inside-out appearance. The building is in the form of an enormous steel mesh, an external skeleton that visually confers a sense of stability and structurally provides the framework into which the floors and partitions are inserted. Each of the elements which comprise the building is colour-coded according to function: white (structural), grey (stairs and lifts), blue (ventilation control), green (plumbing), etc. One of the most spectacular features of the building is the moving staircase that zig-zags up the west façade, offering stunning views over the city as it rises.